One of the best things about the warmer weather is Food Truck Friday at the Carousel. Come experience the array of foods and delicious sweets from a variety of vendors at this magnificent event. Take a ride on the historic Carousel, hop onboard the Carousel Express train, or enjoy a pony ride (weather permitting). Plus, admission is free! Picnic and high top tables are available on a limited basis so bring a chair or blanket, and sit on the lawn. Food Trucks accept cash, credit, and debit. Thank you to our Food Truck Friday Sponsors! 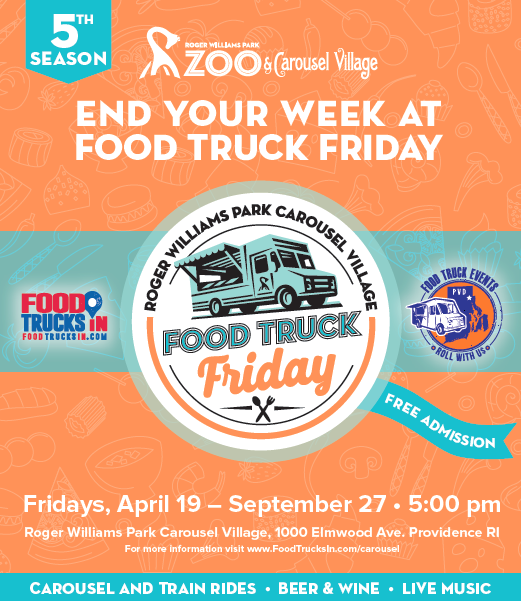 Food Truck Friday is produced by PVD Food Truck Events and Roger Williams Park Zoo & Carousel Village with additional support from Food Trucks In, Trinity Brewhouse, Gooseneck Vineyards, and Motif Magazine.